In the hierarchy of hazard control, administrative control is accepted as one of the control measure of isolating hazards. Safety signage falls under this category where it plays as crucial information system in making work place as safe place to work. There are many ways safety signage is used in making sure hazards such as like pre-warning information or being part of work steps. There is merely no place that without safety signage, be it even at home. Safety signage should be treated as important system that saves lives. Understanding safety signage in workplace makes operation at workplace safer. 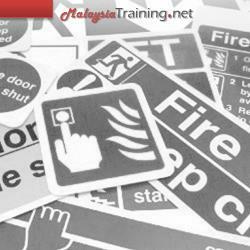 This training course will provide the generic, legality and technicality of safety signage. Attendees will gain insights of various safety signage systems and its applicability throughout industries. Achieve overall understanding of safety signage. Understand the laws governing safety signage. Understand various spectrum of safety signage. Understanding safety signage as control measure. Application of laws in your facility. Safety signage design by law. Incidents due to failure of safety signage. Application of CLASS for your organization. Facility and equipment safety signage. Occupational Safety & Health signage. Factors involve in change management. Signage on project life cycle. Concept of developing integrated safety signage system for a facility. Factors involve in designing safety signage.